Readers' Favorite Review of It's Not Goodbye, It's See You Soon - 5 Stars!!! Here is the latest review for It’s Not Goodbye, It’s See You Soon. Enjoy!!! “N.D. 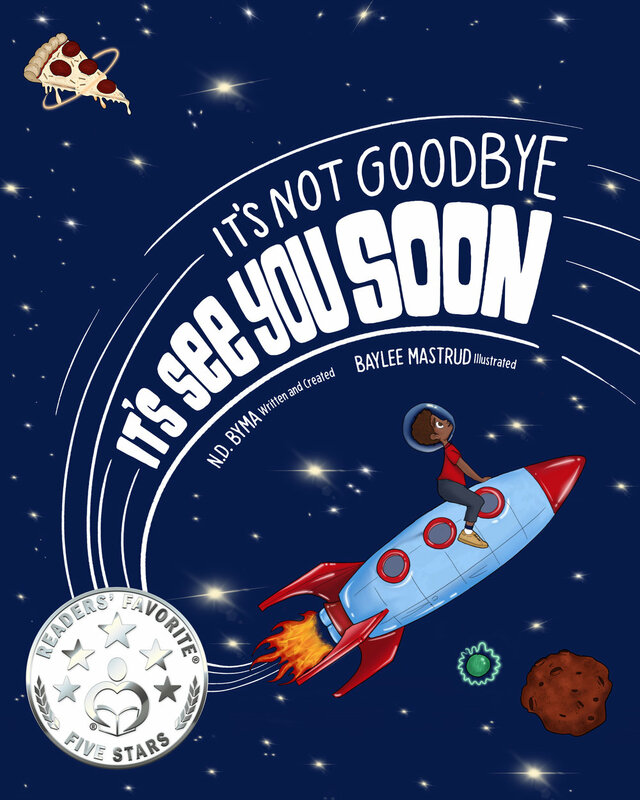 Byma’s It’s Not Goodbye, It’s See You Soon is a children’s book that centers around a little boy named Eddie and his mother. The narrative of the son is non-rhyming but there are some areas that do rhyme when the mother speaks. It’s a beautiful message. The dialogue feels very honest and real as opposed to other children's books. This book won’t dumb down your child in any way, and I appreciate that so much. The illustrations have a life all their own and are colorful, giving you a heart-warming sort of feeling that perfectly matches with the story as a whole. Author N.D. Byma reached right into my being and touched my soul with his children’s book, It’s Not Goodbye, It’s See You Soon. In only twenty-six beautifully illustrated pages, the author managed to make me cry quite quickly and that’s somewhat difficult. When I first saw the title, I had a feeling that this book was really something quite special, and it was. But it was even more special than I expected it to be. The colors of the illustrations by illustrator Baylee Mastrud are vibrant and make a beautiful but silent “pop” sound, if you can imagine that with me. It's Not Goodbye, It's See You Soon AND Rahley are now available! !